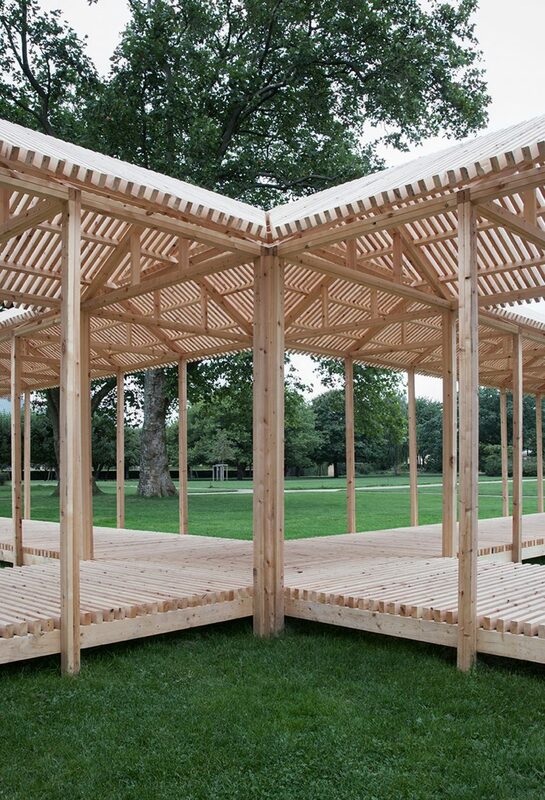 The light filtering through tree-lined avenues inspired this slatted pavilion by Swedish studio Krupinski/Krupinska Arkitekter, which is installed in a cross-shaped formation in a Copenhagen park. Stockholm-based Krupinski/Krupinska Arkitekter used pine wood for the structure to lightly scent the air, adding to the multisensory experience. The intersecting design recalls the history of the Copenhagen’s oldest and most visited park, the King’s Garden. In 1606, King Christian IV of Denmark established a pleasure garden in the renaissance style, with formal pathways arranged around symmetrical planting beds in geometric patterns. A small pavilion was built, which later became the Rosenborg Castle. In 1669, the gardens were redesigned according to the prevailing baroque fashion, complete with a maze leading to an octagonal summerhouse at its centre. The garden and the castle were turned over to the public by the royal family in 1710. The elongated walkways of the King’s Garden Pavilion encourage visitors to promenade along them. The regularly placed wooden columns filter the light like tree trunks, while the slatted roof is intended to mimic sunlight dappling through the crown of a tree. “In addition to the general character of the existing garden, two elements specifically inspired us; the strict axiality and orthogonal crossings of the pathways and the very atmospheric tree lined avenues,” architect Konrad Krupinski told Dezeen. 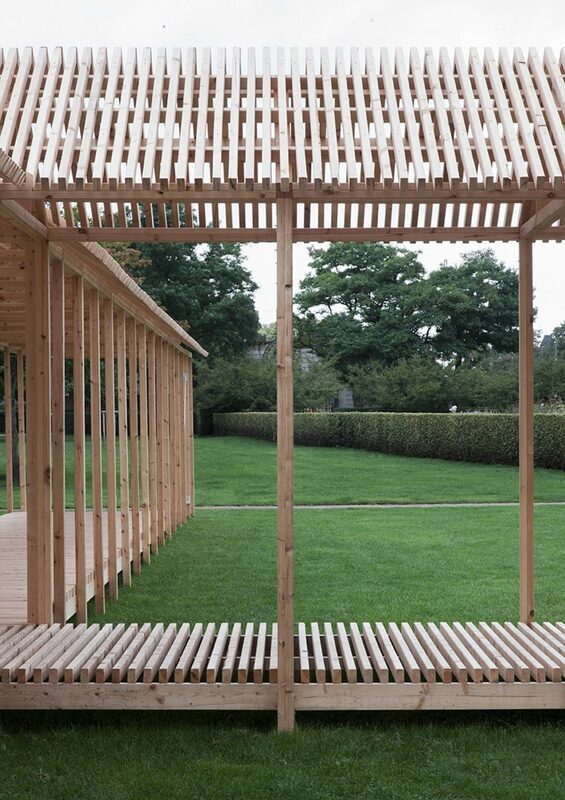 “We hope that the pavilion will enhance the experience of visiting the existing garden; a stylised avenue where one can feel the rhythm of the columns and sense the sun between the wooden members of the roof, a axial movement and a distinct crossing,” he added. 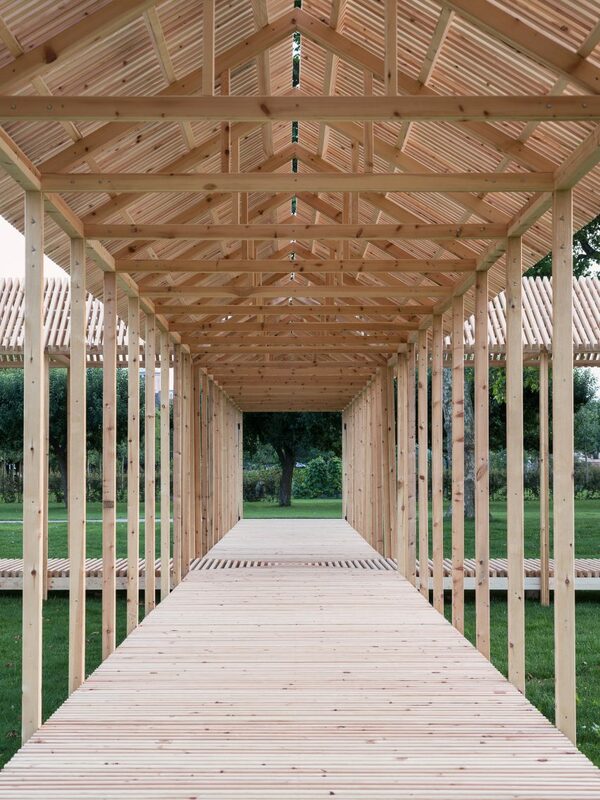 Timber boards are designed to creak underfoot, and the architects hope visitors will be tempted to reach out and brush the columns with their fingertips. 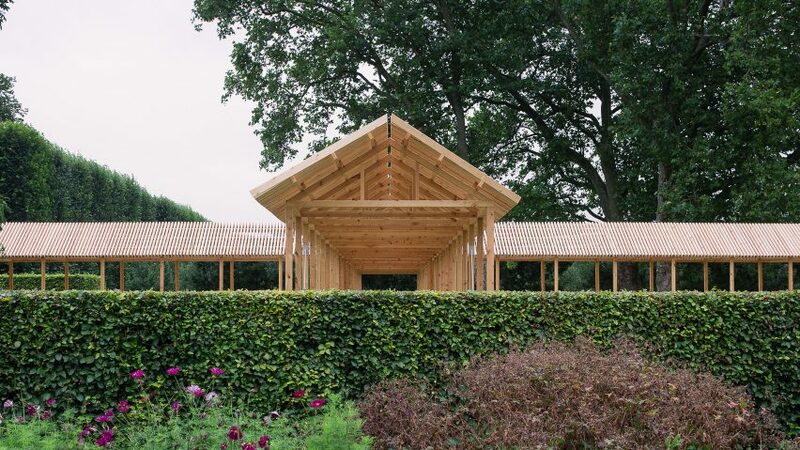 Krupinski/Krupinska Arkitekter was influenced by the strict geometry of the pre-existing formal gardens to create their pavilion formed of right angles, which is accessible from all sides. The corners intentionally create four new new outdoor spaces. The first is a calm oasis filled by broad-leafed trees, providing shade for picnickers or those looking to lounge with a book. The second space is next to the existing Hercules pavilion, which hosts cultural activities and a coffee shop where visitors can sit and people-watch. A large lawn forms the third space, which the architects hope will encourage games of frisbee and football. A permanent stage and a smaller, moveable stage occupy the fourth space, featuring a programme of music, theatre and other performances. 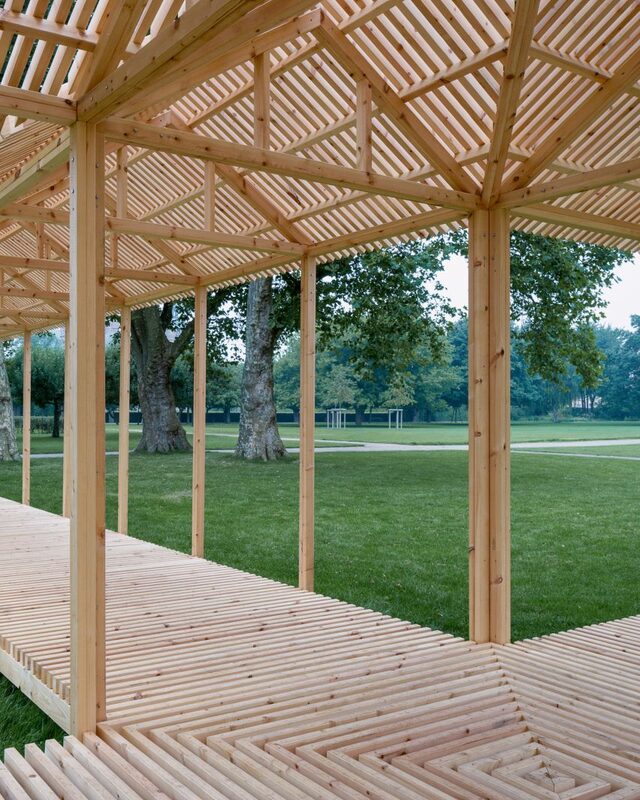 The architects suggest that the pavilion could be used as a stage itself, or used for fashion shows and exhibitions. “We hope that the public takes the role of both actors and audience; at the permanent stage, at the smaller movable stage and in the pavilion itself,” explained Krupinski. The design beat 63 other entries in the biannual competition held by the Danish Architect’s Association. 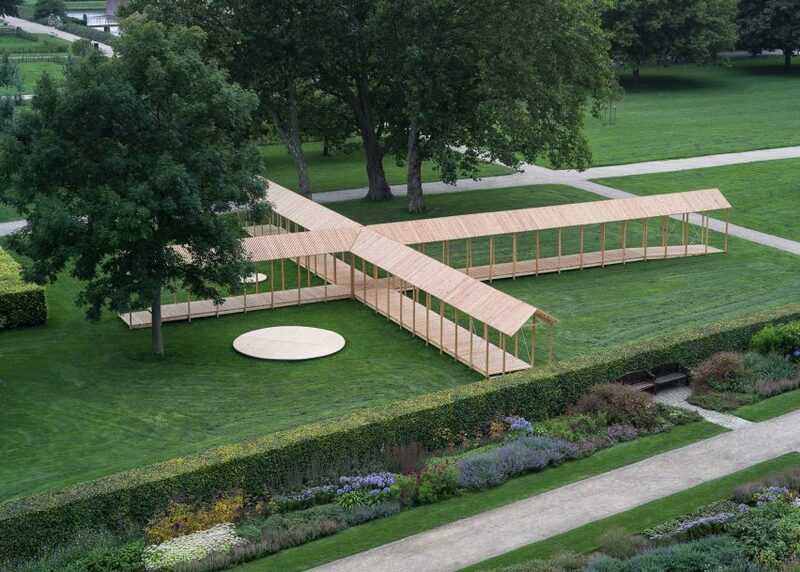 The temporary structure is Denmark’s answer to the pavilions designed by architects for London’s Serpentine Gallery in Hyde Park and the MoMA PS1 in New York. The King’s Garden Pavilion opened to the public in late summer 2017. 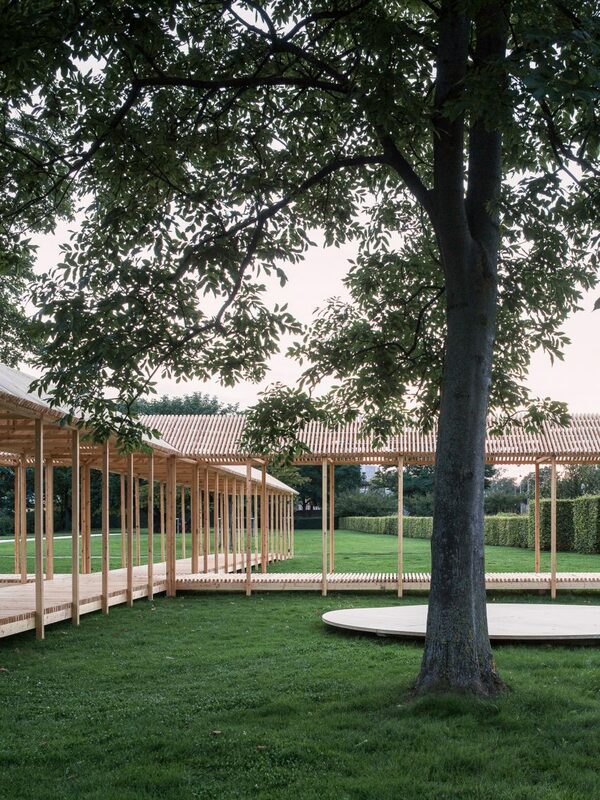 Previous competition-winning pavilion installations include a circular events space by Danish architects Mikkel Kjærgård Christiansen and Jesper Kort Andersen in 2015. In 2013 Dutch design studio FABRIC installed a maze-like structure for their winning entry. Photography is by Hampus Berndtson. @2017 - The Yellow Book. All Right Reserved.